Mountain rescuers are urging hillgoers to be prepared as they head for the Lake District fells, following the deaths of two people in falls recently. Winter conditions prevail on all the district’s mountains, with more snow and freezing weather forecast over the next few days. Teams in the area have been called out more than 30 times already this year. These have included searches for lost and missing walkers, minor injuries and major incidents. Three of the Lake District’s 12 teams dealt with 18 of the callouts. Mike Blakey, Patterdale Mountain Rescue team leader said: “Helvellyn and the surrounding mountains look stunning right now. They are in their glory when they are covered in snow and ice. “Conditions like these draw in large numbers of visitors and locals, whether that’s walking, climbing, or skiing. “It is not for mountain rescue teams to say whether people should or shouldn’t go out and enjoy the winter fells but we have a role to play in helping people to be more aware and contribute to their safety. In these winter conditions the mountain changes and presents challenges for us. “Cornices are common on the edges of the summits and ridges and sometimes it’s difficult to know exactly where the ground ends and overhanging snow begins. It is easy for any of us to walk a little too close to the edge, so the best advice is to give cornices a wide berth. “Likewise, the snow can change from day to day. Sometimes it’s rock solid and at other times we sink through it because it is fresh powder blown by the wind or snow soaked through by rain. “Sometimes it’s really not a simple choice as to whether to stop and put crampons on or to get our ice-axe out. But what we do know is that we should have both with us and should know how to use them. “The snow presents dangers too. Avalanches do happen regularly in the Lakes and many people are not aware of this. “A few years ago four men were avalanched as they summited from Pinnacle Ridge on St Sundays Crag. They were walking over a snow-covered slope when the whole thing moved beneath them and three of the party were swept over the crags below. Remarkably they all survived. Mike Margeson, vice chairman of the umbrella body Mountain Recue England and Wales, said: “Being well prepared and properly equipped is vitally important. 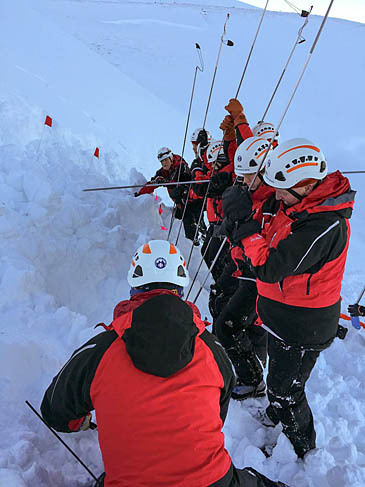 A simple slip in winter conditions is one of the most common causes of winter mountain accidents. “With this in mind we would highlight the importance of having an ice-axe and crampons and knowing when and how to use them. Other equipment carried should include waterproofs, warm layers, map and compass, hat and gloves and headtorch. Rescuers said the Lake District National Park Authority provides a mountain weather forecast with its Weatherline service. From December to March the felltop service also includes conditions from the mountains on the snow pack and actual observed conditions. The Mountain Weather Information Service provides a specialist mountain three-day forecast. The comprehensive forecast includes information particularly for fells above 750m including temperatures, snow line, visibility, wind speed and windchill. Last year was a busy year for rescue teams in the Lake District, with a 5 per cent increase over the previous year to 470 callouts. Earlier this month, Michael Flanagan and David Barrow both lost their lives in separate incidents when they fell from Helvellyn, England’s third-highest mountain.